In the opening plenary, Michael Spitzer remarked that “there’s a difference between being a philosopher and reading philosophy”. If this conference was representative, I think I’ll stick to the latter. 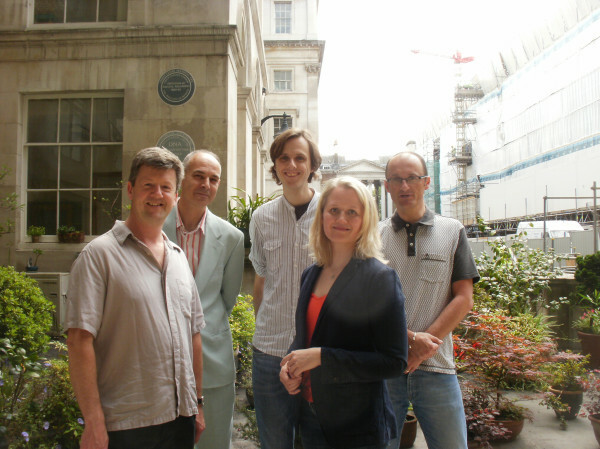 I’m just back from two days at the inaugural meeting of the Music and Philosophy Study group of the RMA. Taking place at King’s College London, this was certainly the best attended RMA event I’ve ever been to. I hadn’t offered a paper because the theme had been advertised as ‘Opera’, which excludes a medievalist (unless they resort facetiously to Latinist literality and offer something like ‘Music and Philosophy in the opera omnia of John of Salisbury’ or some such oblique interpretation). However, if there was one group of people at the conference not talking about opera it was the philosophers — at least, not the analytic philosophers, whose definition of ‘music’ seemed like a blast from the musicological past: the great masterworks (this phrase was used!) from Bach to Brahms provided they were ‘purely instrumental’. Having thus restricted their definition of music, the philosophers I heard proceeded to talk magisterially about it. Luckily I was constantly reassured that I hadn’t stepped through a door in time back into some period before the 1980s by the fact that I had volunteered to be one of the conference’s live-tweeters. Anyone interested in the thread can read it on Twitter under the hashtag #MPSG11, which includes tweets from me and several others, thereby covering most of the parallel sessions of the conference. I kept my tweets fairly neutral, but by the end of the first day I was really quite depressed at what seemed to me to be the failure of the idea of the conference, especially given the buzz it had obviously generated as reflected in the level of attendance. The entire idea seems imperilled by the inequality of the two disciplines involved. In short, all of the musicologists attending had read at least some philosophy but very few of the philosophers speaking seemed ever to have read any musicology at all, and their very understanding of what the study of music writ large might entail — or what ‘music’ might encompass in these terms — was generally lacking. Obviously I didn’t go to everything, so perhaps the parallel sessions were full of musicologically engaged philosophers. But the sole exception to my comments above–and the only example of a philosopher treating opera that I heard — was the single co-authored talk of the conference: David B. Levy and Julian Young’s ‘Wagner and his philosopher-critics’. This paper, which to me exemplified everything that a music and philosophy study group meeting might profitably be doing, was generated from a jointly taught course that these two men — the first a musicologist, the second a philosopher, both with 19thC interests — had been teaching on Wagner. Their agreements and disagreements were productive rather than sterile because they were offering interpretations of music through a historical and critical consideration of the works of dead philosophers and composers. The uncertainty of interpretation and its own awareness of its historical situatedness was in stark contrast to the unequivocal pronouncements about ‘music’ (narrowly defined) and its relation to emotion (not defined at all) made elsewhere in the conference. This, of course, is because Julian Young, while trained as an analytic philosopher, has spent his career writing about continental philosophy. Was there anything for a medievalist (or any historical musicologist)? I don’t want in any way to detract from the achievement of the conference organization (which was expertly handled) or suggest that other people weren’t having a great time (it’s always fun meeting up with colleagues one hasn’t seen for ages), but I do want to suggest that as long as the group is called ‘Music and Philosophy’ it will remain a group about the Philosophy of Music, a subsection of the discipline of philosophy, with the musicologists being the junior partners (even though they actually have more expertise in more kinds of music and musical practice). If it were called ‘Musicology and Philosophy’ instead, it might aid the bringing together of two sets of disciplinary practitioners and their associated scholarly discourses rather than being merely a forum to which musicologists can go to learn the truth about the object of their discipline as pronounced by the practitioners of another. For me, the highlights were hearing a beautiful composition by Jason Dixon involving two hurdy-gurdies, a great bass recorder, voice, and electronics and meeting several early music people to whom I could vent my frustrations. The low points were having to go without food or drink because the breaks were consistently eroded by the inability of most academics — from graduate level to the most senior speakers –to time their papers, not heeding what I always tell my graduate students: more is not always, in fact rarely, more. Stick the logic of that in your philosophical pipe and smoke it! I couldn’t agree more! See my own quite similar response here: http://www.jpehs.co.uk/2011/07/03/music-philosophy-and-live-tweeting/. I’d be interested to know how philosophers felt about the respective engagement between the two disciplines, and whether their impressions approximate those of musicologists. The situation described in your blog isn’t too different from what I’ve experienced on either side of the disciplinary divide in Australia. At musicology conferences (I won’t cite specific examples here), excellent papers on the philosophy of music are often greeted with hostility or poorly received by ill-equiped musicologists (though there are some philosophically trained musicologists out there), while at philosophy conferences, the same papers struggle to elicit responses that move beyond basic definitions of music as ‘organised sound’.